With input from our Corporate Research Network of over 150 organisations, in addition to 1:1 briefings and an in-depth data capture process with vendors, the 9-Grids™ uniquely calibrate data across five key areas: Performance, Potential, Market Presence, Total Cost of Ownership and Future Trajectories across the market. Their aim is to demystify the supply options available to organisations and help learning professionals make informed decisions around their solutions requirements. The growth in the learning technology market shows no sign of slowing down. Investment is predicted to increase, and organisations are under pressure to be more agile, more digital and to deliver more value and business impact. Making sure you invest wisely with the best chances of success is more critical than ever. And there is nowhere else that buyers can get this type of information to support their future innovation and technology choices. Our classification of Next Gen Learning Environments (NGLEs) and Learning Management Systems (LMS) for example, is designed to help L&D differentiate their options in the Learning Systems market around Learning Experience Platforms (LXPs) and Learning Record Stores (LRS) and all the other hype that has sprung up in recent years. Meanwhile, evolving digital learning away from pure-play e-learning content to think about social learning and embedding learning in the workflow for example, shows the breadth of solutions available to L&D teams today. 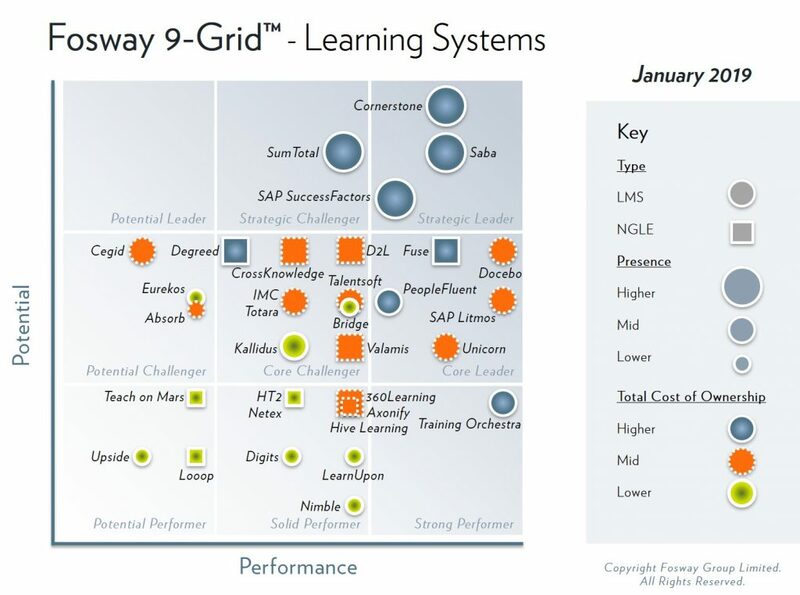 Each Fosway 9-Grid™ is accompanied by an analyst report, outlining some of the broader trends and context in each market. You can download your copies here and they’ll also be available in the Fosway Analyst Lounge at Learning Technologies France on 30th and 31st January and Learning Technologies London on 13th and 14th February 2019.